- Refer the Indications and the Directions before purchasing the product. 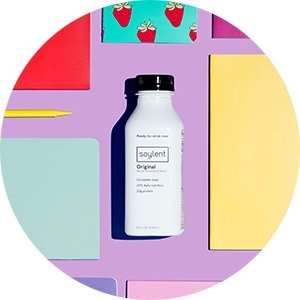 - Soylent Drink is a nutritionally complete, ready-to-drink meal replacement in a bottle. - Each 400 calorie bottle contains 20% of your daily nutritional requirements. - Pleasantly subtle flavor, enjoyable on its own, but also a versatile base for smoothies. - A perfect meal replacement for breakfast or lunch during those hectic days. - Ingredients include isolated protein from soy, slow-burning carbs from beets, and all essential vitamins and minerals. Contains no animal products. We fuel our bodies every day, but often it feels like hard work. That seemed wrong, so we made a meal that takes no work at all. 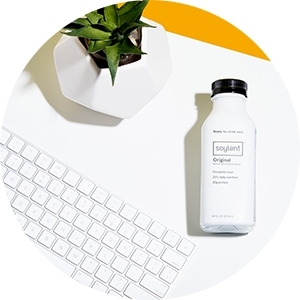 Soylent Drink eliminates the stress and effort of finding a quick, complete, and low-cost meal. Let Soylent Drink take care of your hunger, so you can worry about the important stuff. Maintaining a healthy diet isn’t easy. Everyone eats, but everyone feels like they could be eating better. 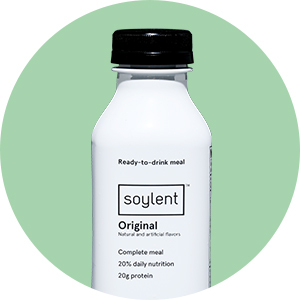 If you’ve ever wasted time and energy trying to decide what to eat for lunch, or felt terrible after eating an unhealthy breakfast on the go - Soylent Drink is for you. Each bottle of Soylent Drink is more than just 20% of your daily nutritional requirements, it’s the freedom to let you choose how you want to spend your time. Many times, food is simply fuel to get through the day. That doesn’t mean it can’t be delicious, too. 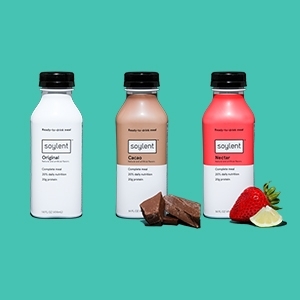 Soylent Drink comes in delicious Cacao, fruity Nectar, and lightly flavored Original. 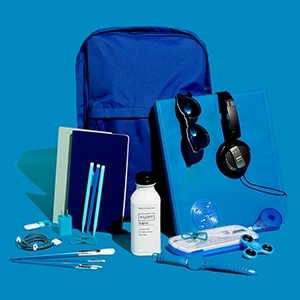 Soylent Drink has been engineered to provide 20% daily nutrition for most people. Ingredients include isolated protein from soy, sunflower oil, slow-burning carbs from beets, and all essential vitamins and minerals. Part of a healthy lifestyle. Feeling good about what you eat isn’t an unattainable goal, but sometimes it feels like one. Soylent Drink satisfies your stomach’s hunger for immediate calories and your mind’s hunger for long-term good nutrition. The foods of the future used to be brightly colored, and packed with salt or sugar. We’ve come a long way, and Soylent is today’s future food: nutrition engineered for function, not excess. A smooth texture with subtle, delicious flavor.